Also known as ‘hallux valgus’ (hallux=toe, valgus=twisted or turning outward), a bunion is a painful condition characterised by a deformity at the metatarsophalangeal joint (MTP), which is located at the base of the big toe (also known as the great toe). Normally the big toe should point forward, however when a bunion occurs, the joint at the base of the toe points outwards, resulting in the toe deviating in an inward direction towards the second toe. In some cases, excess bone formation (exostosis) may also occur. Fluid surrounding the joint can accumulate around the area as well as inflammation of the bursae, a fluid filled sac which acts as a cushion near the joints. The little toe can also develop a bunion, this is known as a Tailor’s bunion or a bunionette. Bunions can develop at any age, however the incidence increases, as we get older. There is a genetic predisposition for bunions. Foot anatomy can make people more prone to developing bunions, particularly if they have wide feet towards the front of the foot. 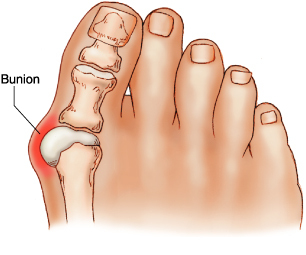 Bunions are also seen more frequently in females than males. This is often attributed to the nature of women’s footwear which often has a narrow toebox, this is made worse in high heeled shoes which push the foot forward into the already narrower space. The jury appears to still be out on whether these factors do in fact lead to bunions or not. However it has been observed that cultures which go barefoot aren’t afflicted with bunions. This would seem to indicate that inherited foot shape along with narrower shoes and/or high heels can increase a person’s chances of developing bunions. Other predisposing factors include arthritis, foot deformities, flat feet, postural problems such as rolling in of the foot (overpronation). Bunions may affect one or both feet. While pain is common, it isn’t experienced with everyone. When symptoms do present, quality of life can be greatly affected due to pain and discomfort experienced. A bony prominence at the base of the big toe, with the big toe pointing inwards, often overlapping the second toe. Reddening of the skin over the MTP joint, over time, this may become painful and swollen. As the MTP joint protrudes outward, the skin can become thickened and callused as it rubs on footwear. Your GP will refer you to a podiatrist, who is a health care practitioner specialising in feet. Often a bunion can be diagnosed upon physical examination of the foot, however your podiatrist may recommend an x-ray to determine the extent of the deformity, measuring the angles of the affected bones and to rule out other problems. During examination, your podiatrist will ask you to move your toe up and down to check the range of movement. Symptoms you are experiencing and how long they have they been present? What kind of footwear do you usually wear? Have you had any foot injuries? Is there a family history of bunions? Do you have any other medical conditions which could affect the foot such as arthritis? Most bunions are managed without the need for surgery. Treatment is aimed at relieving pain and discomfort and halting progression of the disorder. Wearing suitable footwear with adequate space at the front of the shoe. Avoid high heels and shoes which are narrow. Bunion pads may be used to cushion and protect the affected area and relieve pain. Orthotics are inserts placed in the shoes which can help to re-align the bones and help re-distribute weight. Medications to reduce inflammation and reduce pain. Steroid injections to relieve pain and inflammation. Severe cases may require surgery. This is usually performed on an outpatient basis under local anesthetic with light sedation. There are many different types of bunion surgery, which may involve removing the bony growth on the MTP joint, re-aligning the bones back into their correct position, repairing and tightening the ligaments. Recovery time is between 6-8 weeks, but can take as long as 12 months. Depending on the type of work you do, you should be able to return after around 4 weeks. You should not drive motor vehicle until your doctor has given you clearance to do so. This is usually after around 4-6 weeks. In some states it is illegal to drive without medical clearance and you may not be covered by insurance if you drive before you medically cleared to do so. Each surgeon has his or her own post operative instructions which should be followed. You will be sent home with painkillers to relieve discomfort. Apply ice to the area to reduce swelling and pain. Try to keep the foot elevated as much as possible. Avoid getting the dressings wet. This can increase the risk of infection. Dressings will need to be changed after 1-2 weeks. Crutches and/or a cast will be required while your foot heals. Contact your surgeon if any of the following occur. Fever, chills, increase in pain, redness, significant swelling, bleeding or discharge from the surgery site. Wear good quality, well fitting shoes. Avoid footwear which is too narrow towards the toes and limit the amount of time you spend in high heels. If you are a runner, it is recommended you visit either your podiatrist or a specialist running store to have your gait analysed to determine the most suitable footwear for your running style. Long hours spent running in inappropriate shoes can increase your chances of developing a bunion. If you do notice any pain or any changes to your feet, see your GP or podiatrist as soon as possible. The earlier bunions are treated the better the outcome. Please call our Podiatrist Vanessa Hadchiti at Biomechanics Healthcare on 9527 3322, or visit our clinic at 2/23 Cronulla St in Cronulla for more information.